I was reading the newspaper1 the other day when a topic in an advice column caught my eye. A person posed a question about her diet and stated that she had eliminated dairy and bread because they’re unhealthy. My immediate reaction was to wonder why those would be considered unhealthy. Dairy has calcium and bread has a bunch of B vitamins. Then I remembered the fad diets that have been thrown at us, so the “unhealthy” label slapped on dairy and bread made sense. But are those foods really “bad”? If not, then are they “good”? Hell, should we even label them at all? I was not immune to labeling foods when I was in diet mode. I remember sitting at my desk with a “bad” donut in front of me, mesmerized by the thought of what it would taste like. I told myself I shouldn’t eat it. My diet didn’t allow it. After agonizing over whether or not I should eat it, I lost it and just gave in. I consumed my donut with such ferocity that the whole experience seemed to be over within seconds. Then the inevitable happened. An overwhelming wave of guilt consumed me. Why the guilt though? Did I steal the donut? No. I began to wonder why I felt this way for eating, an act necessary for basic living. My husband is a naturally intuitive eater, so I approached him to talk about these feelings of guilt. He looked at me incredulously when I wanted to know if he ever felt guilty after eating. “Why would someone have guilt after eating?” he asked. I was at a loss for words. My mind raced for a logical answer to his question. 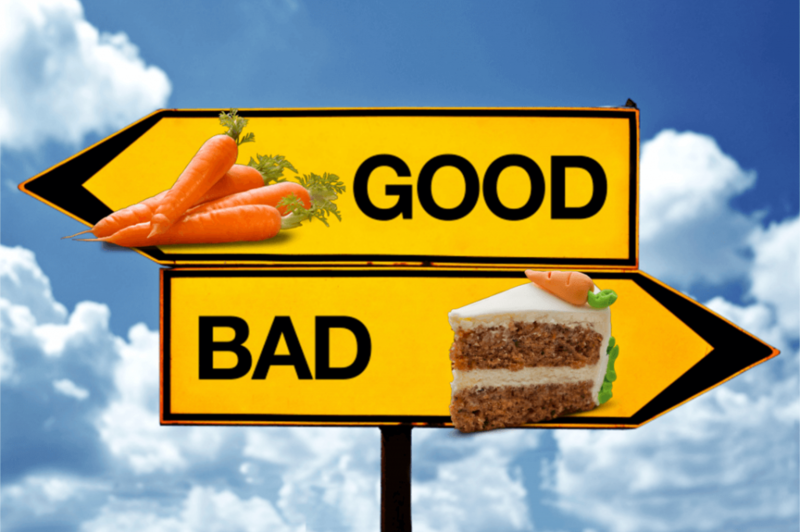 Carrots are healthy and carrot cake is not. Salads are good and burgers are bad. Says who though? I mumbled a response and began to ponder where I even got these ideas from. Guilt is a byproduct of judgement. When I judge food negatively, I vilify it.3 The guilt comes about when I feel I failed at my diet by giving in and eating the “naughty” foods that go against the rules. I feel weak and ashamed, like I lacked the willpower to be “good”. I have come to learn that the quality of my character is not in any way related to how well I adhered to foolish dieting rules. So, how did I stop feeling guilty about eating certain foods? Use a neutral voice. I examine the situation without judgement. Rather than “Carbs are bad”, I say to myself “My body needs carbs to function”. Or something as simple as “I am going to eat a donut now” and leave it at that. I state something factual to silence the judgment. Use a self-compassionate voice. This voice didn’t come as easily for me because it included positive self-talk rather than just neutral self-talk. When this voice started to make an appearance, it would say things like “I’ll be fine if I eat that donut” or “I honored my fullness most of the time this week. A few times I overate and that’s okay.” Being kind to myself slowly reduced my guilt around food. Replace or remove judge-y words. Replacing or even taking words out of my food-related vocabulary helped me change the tone of my thoughts. Inserting words or phrases with more flexibility helped me get away from all-or-nothing thinking. Words like “well”, “good”, “bad” and “naughty” are judgement words. Now I use phrases like “fairly consistent” or “relatively balanced” to describe my day. Reframe “good” and “bad”. I still use these words, but I see them through a different lens. A “good” food is a food that my body appreciates and enjoys. “Bad” foods don’t exist even though there are foods that my body disagrees with. Diet culture trained me to feel proud or guilty about my eating choices when there is nothing inherently right or wrong with any type of food. I should be able to enjoy all foods on a regular basis. And now I do! I notice what I eat, but I don’t judge. If you are someone who experiences guilt when eating certain foods, I completely empathize with you. Slowly begin to release the judgement and the guilt will fade. I know it’s easier said than done, but just take it one bite at a time. Do you feel guilty when you eat certain foods? Please share your experience in the comment section below. 1Yes, I still read the newspaper. I’m such a luddite sometimes! 2Judgement can be subtle and come in other forms too. Ever notice how we have a Devil’s Food Cake and an Angel’s Food Cake? 3Likewise, when the judgement has a positive spin, I put the food on a pedestal. 4Neither of which I have ever done!